We have no idea how long the Arctic ice will continue to decrease, as it did this year to a record low. Most important perhaps, we need to know the biological response to such extremes and the resultant environmental change. Jackie Grebmeier and Lee Cooper work at the Chesapeake Biological Lab. of the University of Maryland. 20 years ago they began visiting the Bering Straits as part of their work in the Pacific Arctic Group. This international grouping discusses Arctic priorities between the many nations involved. Jackie Grebmeier believes the Bering Straits and the Chukchi Seas are most relevant because they are, "the most productive part of the Arctic, and it's in the U.S.'s backyard." Later this month Seattle sees a meeting to establish a Distributed Biological Observatory or DBO in the American Arctic, funded by the national Science Foundation. This means that if, as projected, there is no ice left by 2050, or before, we will at least have an idea of how the environment has changed. Five hot spots are involved, and that's not a misnomer, as you might think. Temperature monitoring will be joined by keeping an eye on salinity, zooplankton concentrations and vertebrate populations. Without this tracing of all factors possible, we will have no options left when that ice finally melts. Geographically ships may soon be able to penetrate in the North further than ever before while people may "people" the Arctic lands more and see great change in their living habits and economies. Change is in the air as well as the ice it seems. "When you go up there you really see changes," said Jackie Grebmeier. Remember she's been there for two decades. Also involved in Chesapeake Bay are visitors from the Polish Academy of Sciences and the Canadian Coastguard Service as well as more local workers and inhabitants. The University of Maryland and the giant bay that Virginia shares with the state bear no relation to Arctic wildernesses, but this long-standing collaboration in the Arctic involves Russians, Canadians, Norwegians and many other governments and individuals. 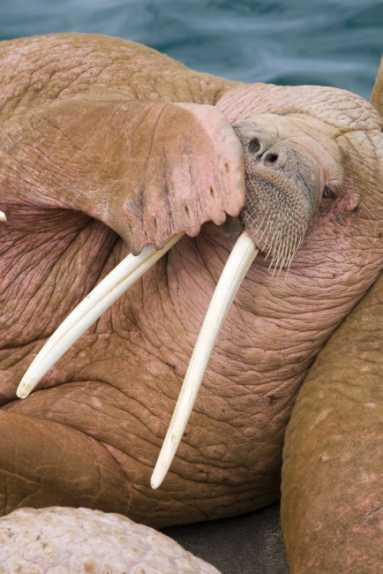 The vertebrates studied by many different groups include walrus, gray whale, bearded seal and eider duck. These species dive to the rich bottom communities under the ice along with many others. The resolution of any problems in feeding in future will be down to past and present studies. The loss of such an ecosystem will bring dire consequences to all of us whether in northern climes or far in the tropical ecosystems.